We are happy to announce that past contributor Donald Morrill from Issue 3 has released his debut novel “BEAUT,” a winner of the Lee Smith Fiction Prize. The book is available for purchase. Congratulations Donald! Benjamin Rybeck presents his debut novel, The Sadness, on Wednesday, October 19 at 7 p.m. Arizona State University creative writing instructor Matt Bell joins Rybeck, with his latest work, A Tree or a Person or a Wall. The event takes places at Changing Hands Phoenix. Benjamin Rybeck is the marketing director at Brazos Bookstore in Houston, TX. He received an M.F.A. from the University of Arizona. His work has appeared in Kirkus Reviews, Electric Literature, The Rumpus, Literary Hub, The Nervous Breakdown, and elsewhere. The Sadness is his first novel. He lives in Houston, TX. Matt Bell is the author of the novel In the House upon the Dirt between the Lake and the Woods, a finalist for the Young Lions Fiction Award, a Michigan Notable Book, and an Indies Choice Adult Debut Book of the Year Honor Recipient, and the winner of the Paula Anderson Book Award. He is also the author of two previous books, How They Were Found and Cataclysm Baby, and his next novel, Scrapper, was published in September 2015. His stories have appeared in Best American Mystery Stories, Best American Fantasy, Conjunctions, Gulf Coast, The American Reader, and many other publications. He teaches creative writing at Arizona State University. For more information, please visit the Changing Hands website. Garth Risk Hallberg will be visiting Changing Hands Phoenix with his debut novel, City on Fire. The event is co-presented by the Virginia G. Piper Center for Creative Writing at ASU. The New York Times, Washington Post, San Francisco Chronicle, NPR, Vogue, Newsday, The Atlantic, and others named City on Fire the Best Book of the Year. The event takes place on Wednesday, September 21st at 7 PM – 9 PM. For more information about the event, please visit the Facebook page or the Virginia G. Piper Center for Creative Writing page. The author was born in Louisiana and grew up in North Carolina. His writing has appeared in Prairie Schooner, The New York Times, Best New American Voices 2008, and The Millions; a novella, A Field Guide to the North American Family, was published in 2007. He lives in New York with his wife and children. At Superstition Review, we like to keep up with upcoming literary events in the Phoenix area. 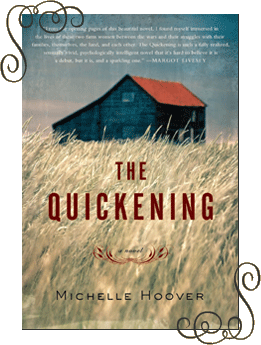 Bread Loaf Writer’s Conference scholar and Pushcart Prize nominee, Michelle Hoover, will be visiting Changing Hands Bookstore on Tuesday October 12th at 7 p.m. She will be reading from her debut novel, The Quickening, which was released in June. Based on her family’s rich history of oral story-telling and her grandmother’s diary, The Quickening narrates an interminable feud between two Iowa farming families. The conflict lasted over four decades, spanning across both World Wars and well into the Great Depression. A timeless tale of humanity’s intuition in times of peril, Hoover’s entrance into the world of literature is felicitous. While The Quickening is Hoover’s first novel, her first-hand experience of growing up in Ames, Iowa ensures validity in her work. It is obvious that this experience combined with the recounted stories from family members over the generations has provided the necessary knowledge to convey this story with immense accuracy. Michelle Hoover has also previously published fiction in The Massachusettes Review, Best New American Voices, and Prairie Schooner, as well as others. She teaches writing at Boston University and Grub Street, Inc., a group that assists writers in developing their manuscripts through six to ten week workshops. Hoover’s website, http://www.michellehoover.net/, includes a list of upcoming readings and events and a video message about The Quickening. It also offers the opportunity to tell your own story about working or growing up on a farm. Stories must have a minimum of 500 words and be submitted by December 1st to be eligible. Two lucky winners who have shared their story will be picked to receive a copy of The Quickening. The winners will be posted on her website on December 15th. You can also follow Michelle Hoover on Twitter via http://twitter.com/quickeningnovel for frequent updates on her successes and recent work.